Unclear on the concept? Check out the About page before you join the party. This week, I feature a rare entry in which my grandfather’s kids seize control of his calendar, and the joyous cries of children are heard throughout the land. One of my dad’s fellow graduates, Eleanor Roberts (later Eleanor Lewis), would later become chief counsel for International Commerce at the U.S. Department of Commerce. Another, Charles Strauss, became CEO of Unilever United States. As for my dad, thirty-odd years in management at Eastman Kodak was waiting … not that he knew that at the time, of course. In the fall of 1961, my father headed off to college at Rensselaer Polytechnic Institute. 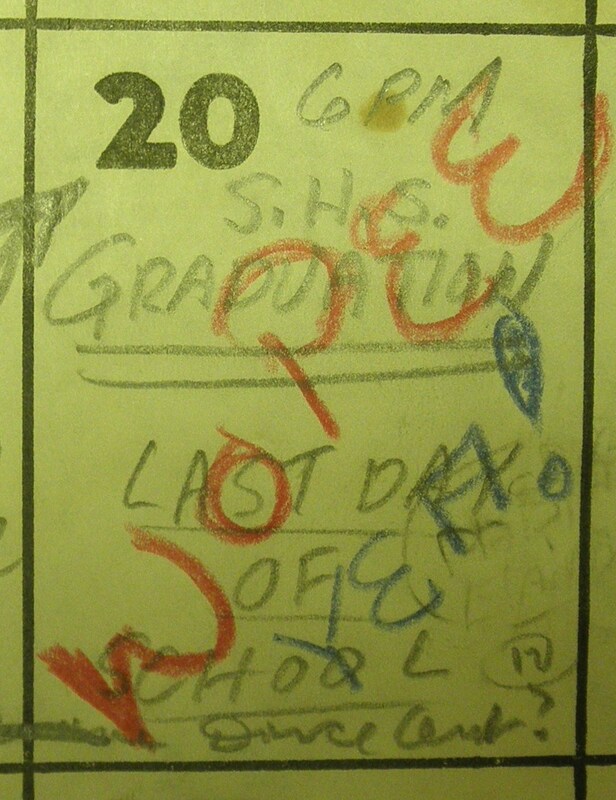 History does not record whether my aunt’s “WOPEE” was motivated by the last day of school, or by the giddy prospect of getting her older brother out of the house. My own high school graduation came almost exactly 30 years after my dad’s, and I don’t remember what my speakers said either, except that one of them held up actor-director Kevin Costner — then making interminable films like “Dances with Wolves” — as an example of the sort of individualist thinker we should all aspire to be. Hopefully my dad’s class got better advice than mine did. After my graduation, most likely I hung out with my girlfriend, which was the same thing my dad had done 30 years before. Some things never change, I suppose. Unlike my dad, I am planning to skip my 20th reunion this year in favor of some splendid isolation in the Finger Lakes. My dad, having attended his 20th and 40th, is going this year to his 50th. Maybe if I make it that far, I’ll think about going. It’s school’s-out season once again as I write this. As they break for summer — and sometimes forever — high school students across America are posting messages of triumph and celebration in their yearbooks, on their Facebook pages and even on their cars. Do any of them capture the moment quite like “WOPEE”? Doubt it. Next week: School’s out, from a different perspective. If that don’t suit’cha, that’s a drag. Autumn 1958: When Giants walked the earth. Another special edition of 5,478 Days. When my grandfather stopped by the Stamford High-Norwalk High football game in October or November 1958, his main purpose was to take pictures of my father, then a skinny sophomore playing in the Stamford High marching band. But when he saw one of pro football’s greatest defensive ends milling among the crowd, my grandpa couldn’t resist asking to take his picture. And, just like any self-respecting local hero would do, Andy Robustelli obliged. At the time my grandfather snapped this picture, the unprepossessing fellow in the gray cloth coat was at or near the peak of a remarkable, late-blooming football career. Robustelli, a Stamford native, turned 16 the day before Pearl Harbor and enlisted in the U.S. Navy two years later. After his tour of duty, he came back to Connecticut and went to college in Bridgeport. He got drafted by an NFL team, but not by much — 19th round to the Rams, in 1951 — and was 25 by the time he went to his first pro training camp. 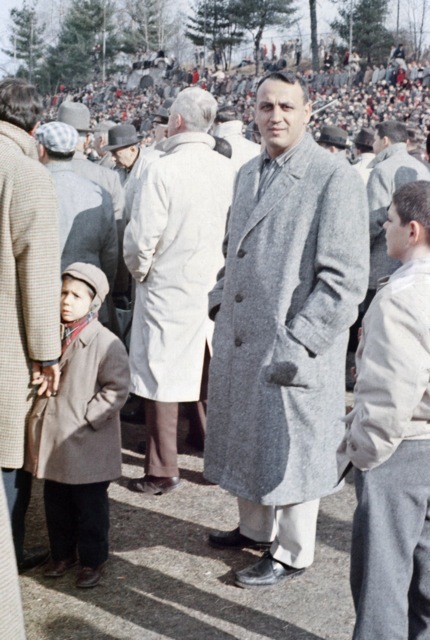 Only two months or so after this photo was taken, Robustelli would take part in the 1958 NFL championship game against the Baltimore Colts — a game celebrated in NFL legend as “the greatest game ever played.” Robustelli’s Giants lost in overtime to the Colts, but the game played a key role in popularizing the NFL and televised pro football to audiences nationwide. Robustelli retired after the 1964 season, and was elected to the Football Hall of Fame seven years later. Back home in Stamford, where Robustelli became a successful businessman, the poor fortunes of the mid-Seventies Giants put scarcely a dent in his reputation. By all accounts, he embodied the old-school example of the local boy made good — humble, grounded, steady and clean-living. People spoke well of him, and meant it. Decades after my grandfather took this picture, Robustelli was still attending Stamford High sporting events to cheer on his grandchildren, mixing unpretentiously with the crowd as he did in 1958. He was not the sort to seek out a neighbor with a camera, but not the sort to shrug them off if they asked for a picture or two, either. My other grandpa, a lifelong Giants fan, also lived in Stamford, and I’m fairly sure that among his effects is a picture of him with Andy Robustelli at one or another civic event. On the football field, Robustelli was an immortal; off the field, he was a quiet, distinguished, but accessible part of his community. Andy Robustelli died Tuesday, May 31, in the city he called home all his life. He was 85.